Have some holes in your family photo album? If you do and you’re looking for something fun to do with your family and holiday house guests the day after the big day, why not plan a family photo swap party? While sitting around the TV to watch the big game is tradition for the adults, it’s not much fun for the kids. It’s essential to have some activities planned so the kids don’t get bored and cranky. A family photo swap is a fun way to keep the kids busy while the adults talk about good times and reminisce about family history. Each sibling or family member can bring their pictures to be scanned and printed to share with the others. Even mom’s best handwritten recipes can be scanned so everyone has a copy and you don’t lose them. Set up card tables for the kids so they can create their own mini albums or crafts using the printed copies. This is also a great party to host for class reunions, childhood friends, sorority sisters, or the gang from the old neighborhood. Tell your guests to bring their own photo albums, scrapbooks, and favorite family photos to share. Hit the craft stores when there is a big sale to scoop up extra frames and supplies to have on hand. Get glue dots, photo corners and scrapbook stickers, etc. Have plenty of USB flash drives available. If guests save scanned images to a flash drive, they will have for future use. Make sure your printer is working well and get extra printing cartridges. Keep the menu simple. Set up a buffet so guests can serve themselves. Cover tables with brown kraft paper or white butcher paper to prevent stains and damage. Set up several work stations for scanning, printing, and assembly. Let the kids make their own books with pictures important to them. 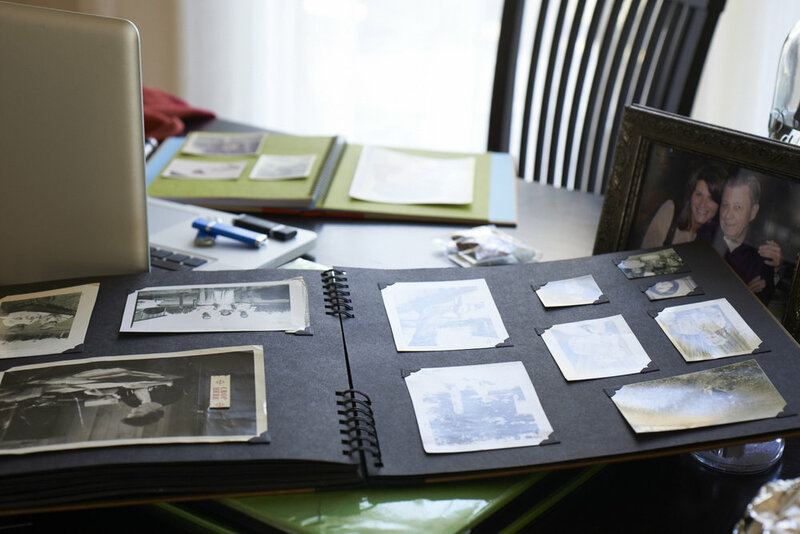 Invite older relatives to come and relate the “back stories” behind the photos so the kids can learn about the family’s past, heritage, and your memories are passed along to the next generation. Make-ahead recipes like soup are easy to make and easy to serve. Make up one or two soups before the holiday and reheat in a Crockpot or large pot on the stove right before party time. Serve with sandwich halves or warm crusty bread. Reliving old memories and making new ones… my kind of holiday fun! With Easter just days away, I've got a fun (and productive) party idea for a Girls Night In get-together. Why not host a DIY centerpiece party? Each year, a few weeks before Easter, I get lots of emails and questions about Easter decorations and tablesettings. Here's a party theme that will not only allow you to spend time with your friends, you can go home with a beautiful centerpiece... just in time for your Easter Sunday celebration. It's also a great party plan for that DIY bride or class reunion, too! Get the girls together for a perfectly creative way to craft your own Easter centerpieces, party decorations for a class reunion, wedding or baby shower or even for that DIY bride. This is a very simple party to host. You provides the drinks, the food, and a large workspace with plenty of room. Guests will bring what they need for her own centerpiece plus tools like floral wire, floral sheers, ribbon, etc. You can all share supplies. Ask guests to email a list of what they are bringing- you may need to make a trip to Michael's, Hobby Lobby or a local floral supply store to pick up the basics if you don't have them. NOTE: If you are planning this party for the week of Easter, you might also set up a station to dye Easter eggs. That way, you can have eggs already dyed for the kids to decorate. Pick up plants and flowers from the garden center to create an Easter centerpiece you can plant and enjoy all summer. Girls Night is soooo about the cocktails and quality time catching up with friends but since this party is centered around an activity, I wanted to keep the menu very simple. A cheese board with 3-4 cheeses plus crackers, fruit, honey, jam and other pairings is the perfect way to start the party. It is easy to assemble and there's no cooking required. Make one of your party favorites that is easy to eat standing up or while working. I made Puffy Party Squares because they are easy, fast and inexpensive but also because everyone loves them. You can also do some lovely egg salad sandwiches because you'll have a ton of eggs on hand. Pretty, colorful drinks and easy food make hosting duties simple! Making centerpieces and decorating eggs can be as easy or as complex as your time and patience allow. If you look at Pinterest, you can see a million different ideas for every taste and every budget. I love the look of speckled eggs. Get the how to here... I'm a big fan of cheap that looks expensive so that's what I was aiming for with my flower arrangement. I also like the idea of repurposing the flowers in the garden or container after the party is over. Carefully wrap the root ball in plastic and keep the roots damp so you can plant and enjoy long after the party is over. Carefully remove the annuals from their plastic container, keeping the root ball intact. Put it into a plastic bag and secure with a rubber band. Use one plastic sandwich bag for each plant. Make sure the soil is damp- but not too wet. Arrange the flowers in a platter, basket, wreath or other short container. Add some fresh cut flowers also for a little height. Done! Create a drying rack of some sort. I used the top of a Styrofoam cooler and some toothpicks for mine. Push in 4 toothpicks and let the eggs rest on top. But you have to rotate them so they don't have a big drip mark on the bottom side. You can also use a circle of tin foil on newspaper. You can use straight pins and a foam board also. Cover the work surface with newspaper or Kraft paper. Boil 1 cup of water and add tea bags to steep to make a strong, dark tea. While the tea is steeping, boil eggs as you normally would for dying. As they are cooling, mix dye according to package directions. Natural looking speckled eggs look best colored pale blue, aqua, pale green, soft tan, and even violet or pale pink. (Yes, hens do lay pink eggs, I promise! ) To achieve a natural look for tan eggs, use the tea to dye the eggs. I also used a small amount of the tea to muddy the bright color of the dye to make a more natural look. Feel free to adjust the colors until you get the dye the color you want. You can re-dip them to get a darker color. I will dip then wipe with a paper towel to set a base color. Then re-dip to make a nice, pale shade. Once you've dyed the eggs, allow them to dry completely. For the speckle effect: dip the toothbrush in a small amount of the brown craft paint and run your finger over the toothbrush, causing the paint to splatter onto the eggs. A random pattern looks good- but keep it very light for best results. Allow to dry and you've got natural looking speckled eggs. No matter which way you color your eggs, I hope you create lots of fun memories for you and your family. Happy Easter!